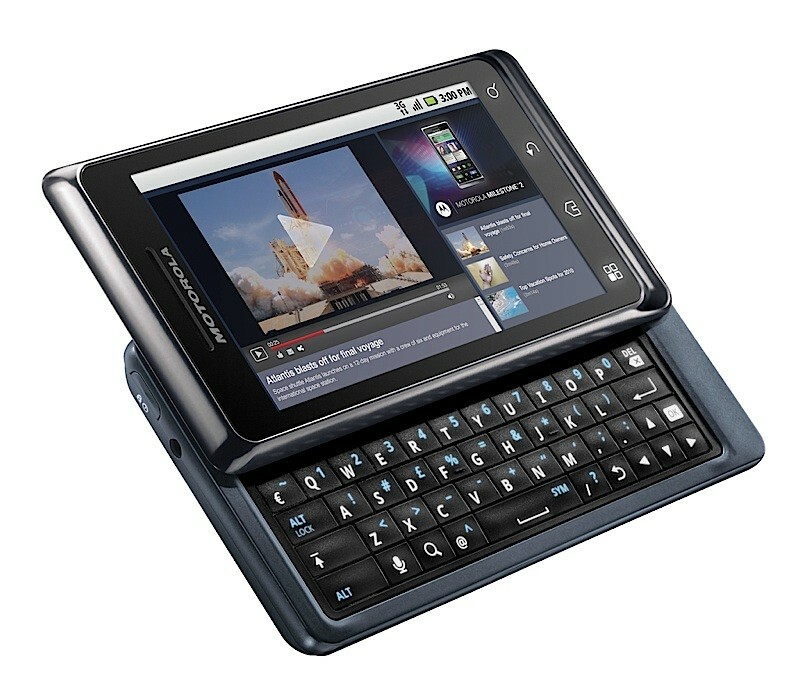 That's right: the Motorola Milestone 2 has just been announced, along with Android 2.2 FroYo, an enhanced MotoBlur skin, a 5MP camera, 8GB of onboard storage as well as an 8GB microSD card, a 1GHz OMAP SOC processor, 512MB of RAM, and 720p HD video recording (one of the Droid 2's major omissions). Laptop users will also be happy to know that the Droid 2's Mobile Hotspot capability has not been removed and is still kicking around somewhere in the apps menu. As far as availability, the Milestone 2 is expected to launch in Europe in Q4, although availability in other locations and pricing have not yet been announced. Press release and video are available for your viewing (and reading) pleasure below. Motorola MILESTONE™ 2 Gives You More for all your Smartphone Needs BASINGSTOKE, September 1, 2010 –– Motorola today introduced MILESTONE™ 2 enhanced with MOTOBLUR™. The Android™ 2.2 device offers more speed, more connectivity, more messaging, more storage, more web with Adobe® Flash® Player 10.1, more multimedia and more personalisation than the original award-winning MILESTONE. The powerhouse device features a 1Ghz processor, allowing users to sift through their content quickly, even when running multiple applications simultaneously or a number of open web browser pages. Respond to e-mails or texts quickly with an improved and more spacious QWERTY keyboard including larger keys and better tactility for easier typing. MILESTONE 2 also acts as a 3G mobile hotspot1 to connect up to five WiFi® enabled devices, so you turn practically anywhere into a hive of productivity. "MILESTONE 2 offers more power, more speed, with an improved keyboard, so users can send, access and share information even quicker than before to manage their work and personal life," said Alain Mutricy, senior vice president, portfolio and device product management, Motorola Mobility. "This introduction not only reaffirms our commitment to innovate on Android but offers consumers the leading edge features they crave including fast web browsing, messaging, application downloads and multimedia." MILESTONE 2 also features the latest version of Motorola's unique solution, MOTOBLUR, which makes it even easier to manage all of your emails, messages and social updates in one easy place with the additions of filtering, resizable widgets, added corporate security and a versatile battery manager. Further enhancements to the original MILESTONE include 720p HD video capture and playback allowing you to capture life's moments in crystal clear detail, whilst the Adobe Flash Player 10.1 allows mobile users to experience millions of rich websites the way they were meant to be seen, including rich video and gaming content, and you can share all of your multimedia with DLNA compatible devices. The experience is rounded off with a connected music player delivering lyrics to your songs, additional artist news and information, as well as integrated social applications for sharing and giving recommendations. Users will have plenty of room for their content with up to 8GB internal memory and an 8GB microSD card inbox, expandable to 32GB. A suite of Google™ mobile applications including Google Search™, Google Maps™, Gmail™ and YouTube™ are also integrated onto the device. Plus you have access to Android Market™ which has more than 70,000 applications. The device ships with an 8GB micro SD card and wired headset, and owners can also download free the Motorola Media Link software that makes transferring your music and other multimedia from computer to phone even easier. The multimedia station is a stylish dock for your MILESTONE 2 or original MILESTONE. When docked, your phone automatically changes to desktop mode showing alarm clock and favourite multimedia applications such as a slide show of pictures. Desktop mode can be personalised allowing you to show the applications you want, all whilst charging your device. MILESTONE 2 will be available in Europe beginning Q4 2010. MOTOROLA and the Stylized M Logo are registered trademarks of Motorola Trademarks Holding LLC. The Bluetooth trademarks are owned by their proprietor and used by Motorola Mobility Inc. under license. Android, Google, Google Search, Google Maps, Gmail, YouTube, Android Market, Google Talk are trademarks of Google, Inc. Adobe Flash is a trademark of Adobe Systems Inc. All other trademark and product or service names are the property of their respective owners. © Motorola Mobility Inc. 2010. All rights reserved. 2 Network and/or SIM card dependent feature, not available in all areas. Airtime, data charges and/or additional charges may apply. Wireless email functionality requires an email account with wireless server capabilities. 3 The unauthorized copying of copyrighted materials is contrary to the provisions of the Copyright Laws of the United States and other countries. This device is intended solely for copying non-copyrighted materials, materials in which you own the copyright, or materials which you are authorized or legally permitted to copy. If you are uncertain about your right to copy any material, please contact your legal advisor. 4 This device supports Bluetooth A2DP, HSP, HFP profiles. In order for Bluetooth devices to communicate with one another, they must utilize the same Bluetooth profile. To determine the profiles supported by other Motorola devices, visit www.motorola.com/bluetoothconnect . For other devices, contact their respective manufacturer.